Hopeulikit can be found in Bulloch County, about seven miles northwest of Statesboro, and 74 miles south of Augusta, Georgia. Throughout much of the twentieth century, John Paul and Beatrice Ellis were central figures in Hopeulikit. They owned hundreds of acres in and around the town, ran a farm as well as the local grocery store and meat market. Like the local dance hall that gave this town its interesting name, those businesses have also disappeared from the local landscape, but the influence of the Ellis family continues to be felt. John Paul Ellis was instrumental in getting a four-lane highway built to the town and also served as a Bulloch County commissioner for many years. In recognition of his contributions to the area, a section of US 80/SR 26 was named the John Paul Ellis Highway. Bulloch County, Georgia was named in honor of statesman Archibald Bulloch (1730-1777). Bulloch served in the Continental Congress as America was preparing to declare its independence from Britain and later served as the first Governor of Georgia. This tiny community was named after an area dance hall that was located just off Highway 80. The popular venue is long gone, but in its heyday during the big band/swing era, it attracted audiences and bands from far and wide. Nearby cities and towns include, Portal (5 miles west-northwest), Statesboro, Rocky Ford, Brooklet, Pulaski, Register, Butts, Twin City and Metter. Time Zone: Hopeulikit, Georgia is in the Eastern Time Zone. Canoeing, kayaking, fishing, camping, and hiking are just a few of the many outdoor recreational opportunities in the vicinity. 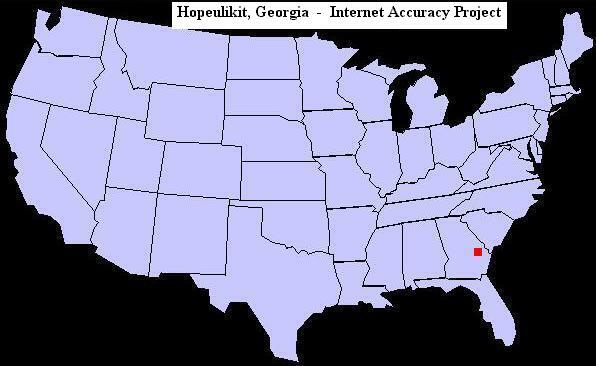 NOTE: Hopeulikit, Georgia is occasionally misspelled "Hopeulikeit" or "Hopulikit."